Bill Baker on "What the hell's going on with Baker's Dozen?" Gemstone Publishing's weekly e-newsletter, Scoop, co-sponsored by Diamond International Galleries, has taken less than two and one half years to achieve a weekly readership of at least 138,000 collectors. Though our audience has been a loyal one over the years Comic Book Marketplace has never been able to reach more than a few thousand. First for Gary Carter and then for me, the goal for CBM has always been to reach as many readers as possible with news and insights into this four-color world we so dearly love. Other than a few odd issues here and there, though, it's never been a money-maker. Instead, as I suspect you already know, it's been a labor of love for everyone involved. So in one sense it's very difficult to tell you that Comic Book Marketplace #121 will be the last issue printed of the magazine. In another sense, though, we're very excited about the future. CBM and our sister publication, Overstreet's Comic Price Review, are both being folded into a new online publication, the details of which will soon be announced. This wasn't a decision made lightly, of course. In the last year, we've gone from 16 pages of color to 32 pages of color in each issue, and the magazine also took on a more professional look. This, of course, was more expensive to produce. If this move had resulted in a substantial increase in CBM's readership, the experiment might have worked. 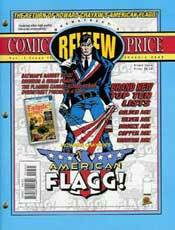 Even though Comic Book Marketplace has now run its course as a printed magazine, the 121 issues will become more collectable and those issues will continue to be a reference for future collectors. 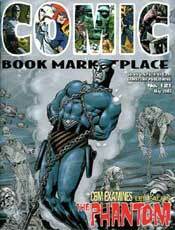 As Editor and Publisher I would like to sincerely thank you for being a contributor to Comic Book Marketplace. This is one of the hardest things I've ever had to write. In a very young year that's already seen the comics community lose its figurative and literal pillar, namely the late and great Mr. Will Eisner, the additional loss of this publication is another serious blow. And while I cannot help but have some feeling of personal and professional loss with the closing of the magazine, there's also a real, much larger sense that world of comics at large has lost an increasingly rare and greatly underappreciated resource. After all, if we are all diminished by the death of one man or woman, as one poet suggested, then what disappears when a magazine that concentrates on the accomplishments of so many fine individuals goes the way of all flesh? I hear a din of stifled voices, and fear that many of their vital stories and involvement in events that helped establish and transform not only this art form we all love, but also, to a smaller extent, helped create and explain perhaps even guide the larger, real world we all mutually inhabit, will sadly be overlooked or altogether neglected by future generations. Still, I'm heartened by the news that some essence of Comic Book Marketplace will live on, albeit in some sort of merged, digital manifestation online. While the hard copy version of this paean to the vital legacy and efforts of generations of comics creators, fans and fellow travels might have left this world, at least the Spirit lives on. We can all take some comfort, and wisdom, from that lesson, I think. Finally, I wanted to extend my thanks to Gemstone's JC Vaughn, who was kind enough to invite me to the party five years ago, to Russ Cochrane, Angela Meyer, as well as the rest of the goodhearted folks at CBM central. Also, each and every one of the creators who spoke with me about their work, along with each and every reader of this magazine, past and present--you have my heartfelt and sincere gratitude. Without your time and energy and efforts, none of this would mean anything. Really. I feel honored by my participation in this grand enterprise. It's been both a rare pleasure and a real privilege to have been allowed to contribute, in however a small a way I might have done, to this fine magazine, the history of comics and your lives. So, the bottom line is this: It's time to Remake & Remodel. It's time for me to rethink, retool and rebrand both my work and myself. All of which I had already begun doing, but my rather leisurely transitioning pace has now been sped up--drastically. However, that need for speed has had a detrimental effect on any number of my ongoing projects, this column included, and I'm sad to report that the situation doesn't look to ease up for the foreseeable future. With all that in mind, I've been forced to reevaluate what exactly Baker's Dozen is and how I need to approach it for the time being. The result is that you'll be seeing BD only about once a month for a while, probably at the end or beginning of each month, for the near term. I'm hoping that by the end of the summer con season I can get not only caught back up, but actually stockpile enough columns to ensure yet another solid, uninterrupted run of bi-weekly, or even weekly, columns. Again, this is not what I want to do, but circumstances dictate this course. It's a temporary solution to a pressing and immediate problem, one which will allow me to concentrate a bit more energy and thought on my forthcoming books and such. Oh, I forgot to mention that, didn't I? Airwave Publishing will release Alan Moore Spells It Out: On Comics, Creativity, Magic and much, much more, just in time for the holiday season. Appearing not only with Alan Moore's approval, but also his blessings, Alan Moore Spells It Out presents my three-plus hour conversation with Alan in its entirety, augmented by the occasional B&W spot illustration and supplemental material, all gathered beneath a full color cover featuring a photo taken by none other than José Villarrubia. All for about $10. Be aware, though, that we plan on printing only a limited number of extra copies above initial orders, and there are no plans to reprint this volume at any time in the future. Seriously. With that in mind, I suggest that you to pre-order it. I believe that Alan Moore Spells It Out: On Comics, Creativity, Magic and much, much more should be offered by Airwave Publishing in the November, 2005 cover dated Previews catalogue. And I'm pretty sure that you'll hear about any other such projects and the opportunities to spend your hard earned money on them, both here and elsewhere, when the appropriate time arrives. Until then, enough with the pimping. End of BB Hype! In the meantime, I'd like to thank you all, not only for your continued patience, but even more for just showing up here regularly. In a world where time is probably the most precious commodity anyone has, the fact that I've got a group of regular readers for this column, and my work in general, is a truly heartening thing. Without you folks reading what I report, all this would amount to little more than the sound and the fury of a tree falling in the forest, unheard by anyone. You literally give this column, my work, meaning. I can only thank you from the bottom of my heart for that kindness, and keep trying to make it worth your while to return here again and again.